Why do I need a Chandelier Winch ? The right chandelier does look stunning and if chosen wisely will complement a space well and for the more adventurous interior designer, the chandelier will often be the centrepiece to the room. There is however an issue on for how long that sparking crystal chandelier will continue to look fabulous before the dust starts to settle and that glisten starts to disappear. Now if you have your chandelier in a room with a relatively low ceiling then it is now a problem to gain access to clean the chandelier, but if your chandelier is positioned high on an ornate ceiling or at the top of a stairwell then access is not straightforward. In this case the only sensible solution is to fit a chandelier winch . Is it easy to fit a Chandelier Winch? The ease by which a chandelier winch can be fitted is all dependent on the type of winch and where it needs to be installed. Some winches are large electric motor devices which, due to their size, are fitted remotely from the top of the chandelier chain and then have a pulley system to lift and drop the chandelier. These systems do work well providing you have somewhere to house the winch as invariably they are too large to fit into the floor void between the ceiling and the floor of the next storey. The preferred winches from Classical Chandeliers are of a compact size so they can actually be placed within the floor void as a self contained unit. This makes installation far simpler. How to fit the Chandelier Winch centred on a Joist? The 100kg operating load chandelier lift which has a maximum lift of 5 metres is just 330mm by 330mm wide and has a depth of just 60mm which means that it can easily be fitted into the floor void. In fact the dimensions of this winch, together with the 150 kg operating load chandelier lifts, are compact enough to be neatly housed actually between the ceiling joists, where the standard 400mm joist spacing has been used with 50mm wide sawn joist timber. For a new build this is perfect and assuming that the positioning of the joists is right for where the centre of the chandelier need to be this is fine. However, invariably you need to position the winch just where the joist is and do not have the luxury of sliding the winch in between the joists. This means that the installation process is slightly more complex so I will cover this senatio first and then the simpler option. The procedure is to cut hole in the plasterboard at the position where the winch requires fitting and then to trim back the central joist by 40mm. If the ceiling is load bearing check with a structural engineer first, but then you would typically strengthen the joist by a process known as “joist sistering”. Here 2 reinforcing members are screwed and glued to the side of the trimmed joist to reinforce it due to the trimmed base. If the joist is holding a large load you may need to prop the joist prior to sistering to avoid any sag in the joist prior to the reinforcement members being put into position and the glue setting. 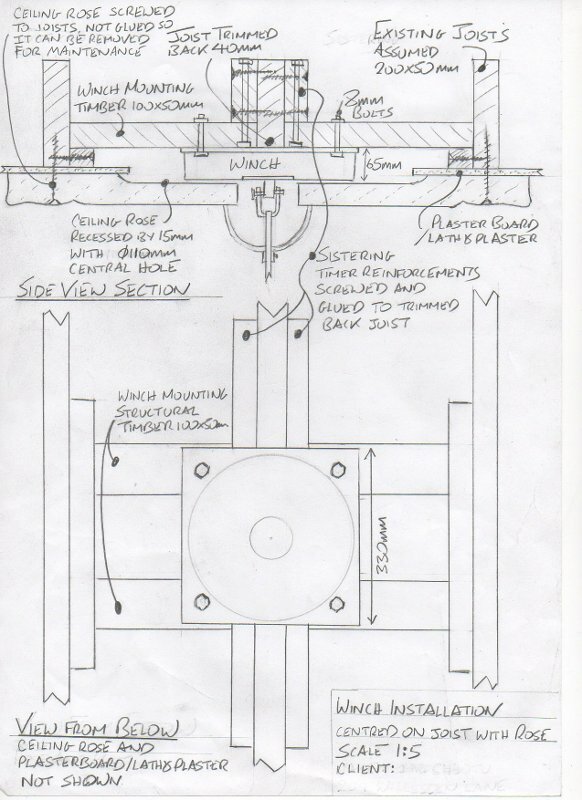 After this has been done you can simply add the winch mounting timbers as shown in the installation sketch and then bolt the winch to these using 8mm diameter bolts. It is always advisable to make the winch accessible for maintenance purposes because it does not matter how reliable they are, there is always a possibility of failure. To this effect in this drawing a ceiling rose is used which is recessed in the back for the winch and then screwed through into the joists. Now it is advisable to use a rose which is sufficiently strong to allow it just to be screwed into position as you would not want to use glue so it cam be easily removed in the future if necessary. Fitting the chandelier lift between the joists can easily be done using a procedure similar above but it is much simpler. There is no need to trim and joists or perform any sistering as you can simply connect mounting timbers between the joists and bolt the chandelier lift up to these. In this case there is also no need to recess the ceiling rose as the chandelier winch can be fitted higher up between the joists. The wiring is then very straight forward for both these scenarios because the winches draw only around 200-250 watts which means that the normally lighting circuit electrics can generally be used. And finally if you have any questions feel free to ask Classical Chandeliers. Previous PostBringing life to your Halogen DownlightersNext PostLooking for classic chandeliers or that contemporary chandelier! “Fitting chandelier winches” ended up being honestly engaging and useful! In the present day society honestly, that is very difficult to accomplish.